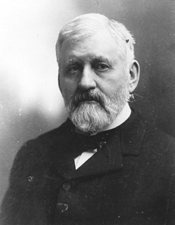 ALLISON, William Boyd, a Representative and a Senator from Iowa; born in Perry, Ohio, March 2, 1829; attended country schools, the academy in Wooster, Ohio, and Allegheny College, Meadville, Pa.; graduated from Western Reserve College, Hudson, Ohio (now in Cleveland), in 1849; studied law; admitted to the bar in 1852 and commenced practice in Ashland, Ohio; unsuccessful candidate for district attorney in 1856; settled in Dubuque, Iowa, in 1857 and resumed the practice of law; served as a lieutenant colonel in the Union Army during the Civil War; elected as a Republican to the Thirty-eighth and to the three succeeding Congresses (March 4, 1863-March 3, 1871); chairman, Expenditures in the Department of the Treasury (Forty-first Congress); declined to be a candidate for renomination in 1870, but was an unsuccessful candidate for the United States Senate; resumed the practice of law in Dubuque; elected as a Republican to the United States Senate in 1872; reelected in 1878, 1884, 1890, 1896, and again in 1902, and served from March 4, 1873, until his death on August 4, 1908; Republican Conference chairman (Fifty-fifth to Sixtieth Congresses); chairman, Committee on Indian Affairs (Forty-fourth to Forty-fifth Congresses), Committee on Appropriations (Forty-seventh to Fifty-second, and Fifty-fourth to Sixtieth Congresses), Committee on Engrossed Bills (Fifty-third Congress); died in Dubuque, Iowa; interment in Linwood Cemetery. American National Biography; Dictionary of American Biography; Cooper, Vernon. The Public Career of William Boyd Allison. Ph.D. dissertation, State University of Iowa, 1927; Sage, Leland. William Boyd Allison: A Study in Practical Politics. Iowa City: State Historical Society, 1956.